Cab-O-Sil is the name for a range of amorphous fumed silica products made by Cabot Corporation. The molecular structure consists of nanometre droplets of amorphous silica fused into branched chains. They are characterised by high purity, low bulk density and submicron particle size. Cabot Cab-O-Sil® M-5 is a medium surface area fumed silica which imparts a significant increase in viscosity to liquid systems, free flow of powders and reinforcement of silicone and organic rubbers. 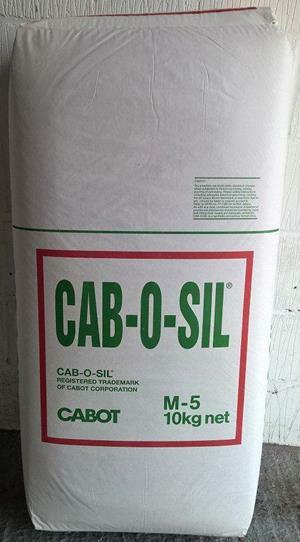 Cabot Cab-O-Sil® TS-720 is a medium surface area fumed silica which has been surface modified with polydimethylsiloxane. The treatment renders it extremely hydrophobic, with very different properties to untreated silica grades like M5. Blended into sticky and poorly flowing powder systems, M5 reduces angle of repose and improves powder flow. During storage of powder systems, M5 reduces caking and blocking. It can also be added to sulphur to reduce the static and improve flow. A good starting point when formulating for these purposes is 0.5% by mass. 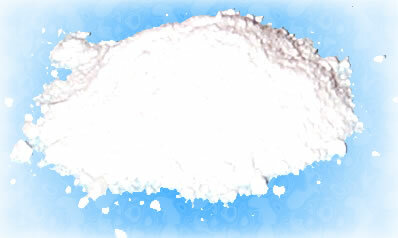 Widely used to provide thickening, thixotrophic (shear-thinning), and anti-settling behavior in liquid systems. M5 is most efficient in non-polar to medium polarity systems. For more polar systems, treated fumed silicas are more effective. M5 offers the best balance of thickening efficiency and dispersibility. Can be used for reinforcement of silicone rubber and can be used to reinforce organic rubbers. It imparts good increase in hardness, tensile and elongation. CAB-O-SIL TS-720 is Cabot's most hydrophobic treated fumed silica making it an excellent choice for moisture sensitive systems. Further the surface chemistry of TS-720 makes it very effective, stabile rheology control additive for polar systems. In epoxy adhesives and coatings, TS-720 provides good thickening efficiency, sag resistance (for film build) and anti-settling of pigments and fillers. While untreated fumed silica may also provide the similar rheology control initially, only TS-720 provides stable rheological properties over time. For applications requiring storage stability, TS-720 is recommended. In polyurethane adhesives and coatings, TS-720 provides the same stable rheology control as in epoxy systems. In addition, the hydrophobic surface of TS-720 introduces very little moisture into these systems, preventing premature cross-linking of moisture cured systems. CAB-O-SIL TS-720 is used for rheology control of vinyl ester laminating resins and bonding pastes. While untreated fumed silica are effective thickeners of unsaturated polyester resin laminating resins, gel coats, and bonding pastes, TS-720 is a more effective rheology control additive for higher polarity systems like vinyl esters. The hydrophobic TS-720 grade can be used in fly fishing for keeping flies dry and nail artists can use this grade to suspend glitters in clear top coats. There are some restrictions on food, medical and cosmetic applications for the M5 grade of Cab-O-Sil®, please refer to the downloads section at the bottom of this page for more details. Particle size: Submicron. Max 0.02% residue on 325 mesh (M5). Brand: Cabot UK (Bags less than 10kg repackaged at Inoxia). A certificate of conformity is availabe for this product, you will need to add this product to you cart. Silica will not degrade with time however it should be noted that certain grades will absorb moisture and other vapors. Due to this it’s recommended that silica is stored in a clean, dry area away from chemical vapors at ambient temperatures. While we list the expiry date on documents this is based on the shelf life of packaging – meaning that if stored as per instructions on MSDS (usually in section 7) then the material will not degrade with time. The only expected product changes are based on moisture absorption and application properties. For further details see 'Cab-O-Sil Storage' in the Downloads section below. Read label before use. Keep out of reach of children. If medical advice is needed, have product container or label at hand. Irritating to eyes. May cause sensitisation by skin contact. Do not breathe dust. Avoid contact with skin. Avoid contact with eyes, In case of contact with eyes, rinse immediately with plenty of water and seek medical advice. After contact with skin, wash immediately with plenty of soapy water. In case of insufficient ventilation wear suitable respiratory equipment. Dry powders can build static electrical charges when subject to friction by mixing, sliding, pouring or conveying. Proper safety precautions including adequate electrical grounding, inerting the air space above flammable or explosive liquids etc, should be taken to prevent accidents. Refer to NFPA no -77-1984 for further details.